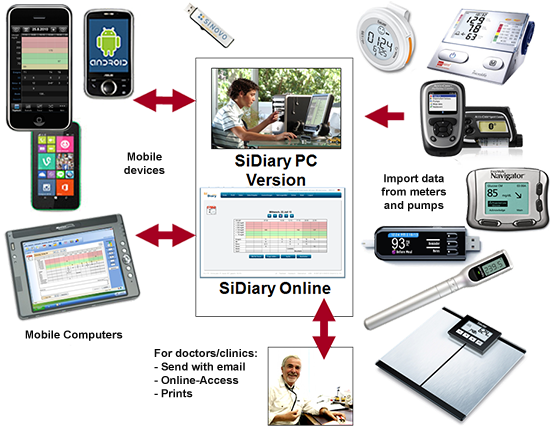 SiDiary makes the control of diabetes so much easier. Data capturing is a cinch and analysis will help to improve your therapy. We have included great new features with version 6 to help you getting started in the easiest way ever possible, even for computer rookies! The key is a profile wizard that will ask a few diabetes related questions and that will configure the software with your answers so that it fits best to your personal needs and skills! If you are just a computer starter our software will provide slimmed menus. You can select when to start with more complex functionalities! Simple interface for data entry, use of different devices for entering data (Windows-PC, Android, iPhone, Windows Phone) with automated sync-mechanism and merging of all data. Automated sending of SMS messages (Android) or email (iOS) to your doctor or a trusted person if you have tracked a critical blood glucose level. Please consider that although SiDiary will provide great help for your daily life with diabetes, it cannot replace consultations with health-care professionals! It can replace your paper log but it cannot give medical advice! With our inbuilt translation tool it's pretty simple to translate SiDiary into every language you want. Click at the picture to read more about it. Click here to download the adware version of SiDiary 6 for free!